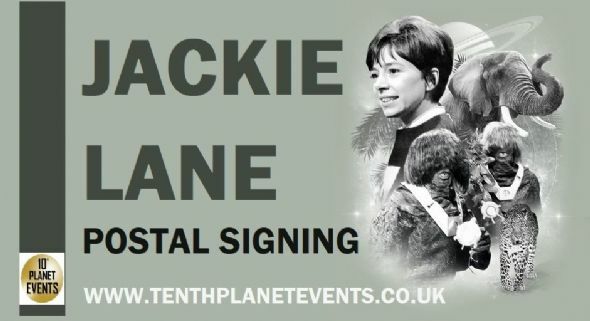 Jackie will happily sign your personal items and/or photographs. Postal Signings will close on the date shown below. Once we have received every one's items we will take them to be signed. Once signed we will return them to you swiftly. Please be patient in waiting for your order as this process can take time. She went on to become a theatrical agent, representing Tom Baker, who would play the Fourth Doctor, and Janet Fielding, who would play companion Tegan Jovanka and managed the late Nicholas Courtney. In 2013 the BBC began production of a docudrama titled An Adventure in Space and Time, telling the story of the creation and early days of Doctor Who, as part of the programme's fiftieth anniversary celebrations. Lane appears as a character in the drama, played by actress Sophie Holt. Jackie Lane also acted under the name Jackie Lenya. Also, Jackie Lane made a brief TV appearance during Doctor Who: The Afterparty, celebrating 50 years of Doctor Who.